I forget why it's called Bob. Thinking about a girl whom I helped make a dulcimer from a kit, in the local bookstore I found and bought "Constructing the Mountain Dulcimer". From Constantine's I got my material: mahogany peghead, spruce top, bird's-eye maple sides & back, walnut fretboard, fret wire, violin pegs. I stained the maple with hand squeezed walnut husk juice. Later I removed the stain, added the chromatic frets and replaced the violin pegs with simple friction banjo pegs, and my mom Patricia Windrow painted critters on it. Then while I was away somewhere, someone came by and bought it. I never met them; I hope he's still being played. The Original Dulcimer Song was written on Bob, but recorded on Smaug and Old Grishnakh. Named after a treefrog I once kept. The peghead has a little frog sculpted sitting on it, barely visible in this blowup. Like Bob, the wood was from Constantine's (this time, rosewood back and sides) except the fretboard which was rosewood-veneered oak from a dead harmonium. Also like Bob, he chromatic frets were added later to the original diatonics with imprecision but close enough. 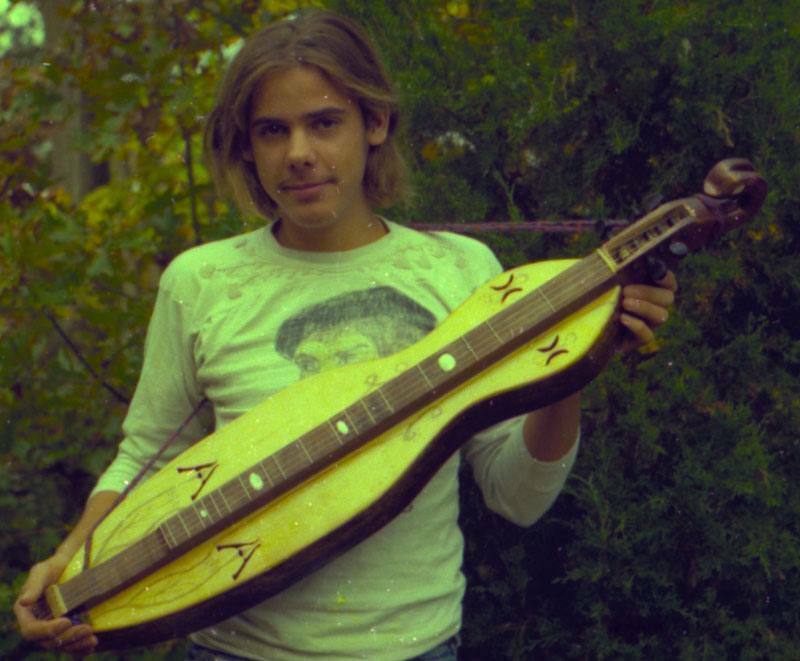 "Adam's Dulcimer Song" was composed on Tyrone. Named for the famous dragon of Erebor, painted by Patricia Windrow on the back. Built for my brother Moondi and as usual he played the heck out of it, but then moved on to banjo and finally GUI-tar. It sounded better than the previous dulcimers, possibly because the top and back were mahogany, a very resonant wood, or because the body was strongly tapered from peghead to tail, focusing the sound like a trumpet, or both – but this led to many tapered-bodied dulcimers such as Arwen. Cherry sides, fretboard/peghead maple, with a snakehead carved by me and painted by Pat. Moondi holding the recently built Smaug. A closeup of Smaug's back is below. Named for Jack Kelly, Janette Carter's last husband. He didn't deserve it. Walnut top, back and peghead/fretboard, poplar sides, bone bridge. My first try at a bass dulcimer, this photo shows the original peghead where the strings came up through the holes between the frets to the normal nut spot at the beginning of the body, except for the two long bass strings, coming in at higher frets, sort of like the extended string on a bass viol. "Messenger of Love" was composed on this dulcimer. 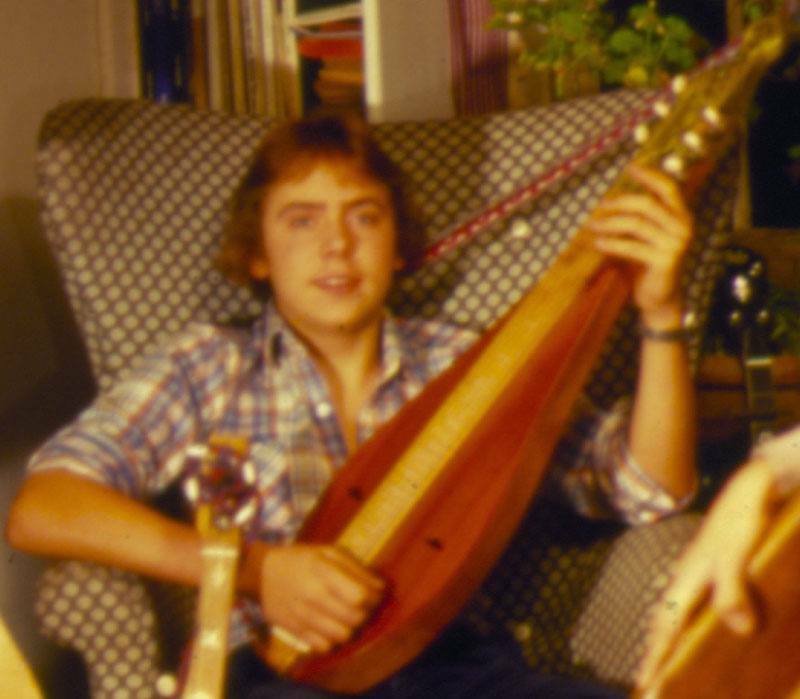 Later, after Arwen was built, Jack's peghead was shortened and all but four strings were removed, and a sitar-buzz bridge was put in, making Jack now a tamboura-dulcimer, owned by Howard Klein.